Complex Says: Dani Pedrosa broke his left collarbone at the end of the 2010 MotoGP season, in which he'd come a career-best second in the world championships. He figured he'd have enough time to heal completely before the 2011 season started, but found out otherwise when his left arm went numb during the season opener in Qatar. Subsequent tests revealed that the plate that doctors were using to hold the collarbone together was pinching a nerve. 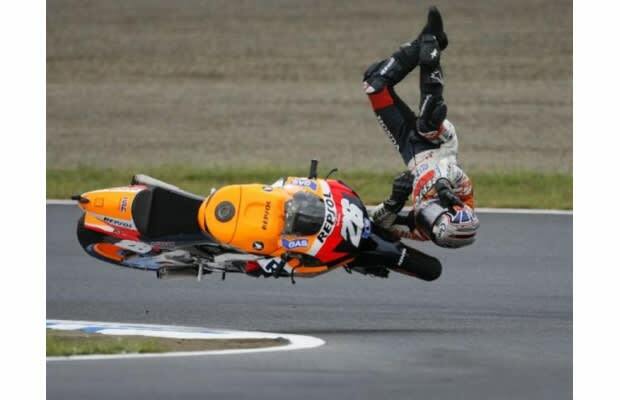 After Pedrosa had the plate removed, he went on to whomp his competition, winning the very next race in Portugal. Later in 2011, he broke his right collarbone--and took three races off to make sure he was back to full fitness.